One of the most frequent requests BOA receives on its telephone hotline is for a referral to a local ostomy nurse. Officially an ostomy nurse is an ET (Enterostomal Therapist) or WOCN (Wound, Ostomy, Continence Nurse). If their degree is a CWOCN that tells you that they are also Certified by going through vigorous additional education and certification in ostomy management beyond their RN degree. Memorial Hospital West (954) 432-2650, 703 N Flamingo Rd, Pembroke Pines, FL 33028. The ostomate needs a referral with a diagnosis written on it. The physician office calls or the patient and the appointment is scheduled based on availability. at Memorial Regional Hospital Ostomy Outpatient Clinic. For information please call (954) 265-4512. 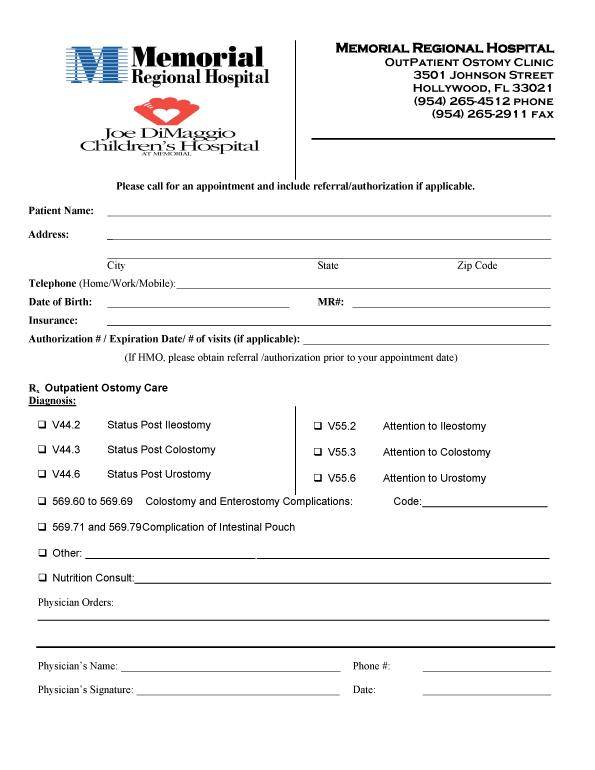 To print out a referral/authorization form for your doctor click here.